Those "ribber" grips are the most comfortable handgun grips I have ever used. They absorb a lot of the beatdown from my .44. Add to that, the fact that the tracker series of guns are ported and you get a powerful, yet relatively mild shooting magnum. I was thinking about my .44 Magnum earlier today when I was out walking my land near the Colorado border. There were Cougar tracks in the snow. I had my Glock 32 (.357 Sig), but nothing says hello to predators quite like a .44 Magnum. This is the .44 Magnum. It is the same platform as the .357/9mm. It has a 5 shot cylinder and is surprisingly comfortable to shoot. I attribute that to the grips and the ported 4" barrel. The barrel is not interchangeable. The cylinder is. 9mm is essentially a .35 caliber, so the existing .357 barrel is perfect. 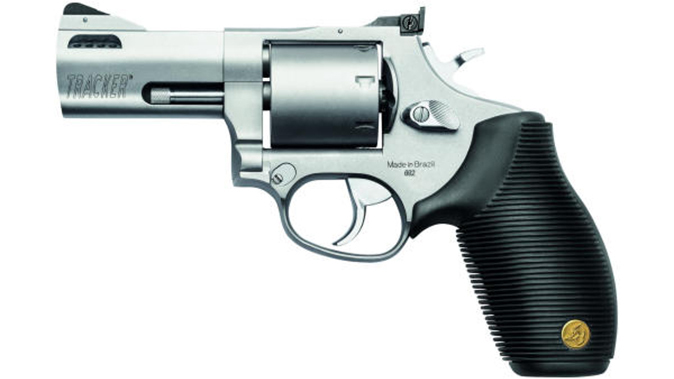 The revolver is a Taurus 692. It is one of the "Tracker" series. I have a Tracker .44 Magnum and it has been a great gun. I know a lot of people don't like Taurus and for a long time, their autos were kind of hot or miss. Their newer generation guns have come a long way. I have always liked their revolvers and now their autos are proving quite competitive. Barrel was an error I meant cylinder, Taurus tracker are very nice looking revolvers, Ive never fired one. Those grips look comfortable, I put hogues on everything I have, I have big hands and I loathe small grip, years ago we only had pachmyr, now I like hogue better. A friend of mine carries the 617 7rd Taurus, nice gun finish is "Ok" definitely not to SW standards but it shoots really well, ive fired it. I have two guns with Pachmayrs on them. My 70 series Colt Combat Commander and one of my Smith Mod 66s. Everything else is Hogue, except that Tracker. I left the factory grips on it. I agree with you. I find Hogue grips to be more functional and comfortable. Ever check out a Chiappa Rhino, comes in alot of sizes a unique looking 357 alot of people like them, some hate the looks, they are expensive and chiappa pistols are dirt cheap. Rather than clutter up another thread about "virtual" guns, this thread is anything about actual guns, ammunitions, optics, etc. It's not about gun rights, since here, that's a given. Those who saw the movie "Wind River" saw Jeremy Renner's character use the Marlin 1895GS, the same rifle I have, in the movie. Although there was some "Hollywood" in the movie about the accuracy of the rifle at long range, the impact it had on the bad guys isn't exaggerated. The .45-70 commonly has a 300 to 350 grain bullet (the lesser one being a hollow point). By comparison, the 5.56mm/.223 round uses a 55-62 grain bullet. When talking rounds, the old physics formula F = MA, Force = Mass X Acceleration, comes into play. Very nice lookin rifle. What's YOUR bullseye range? Thanks. Most ranges only go out to 100 yards, but the one I go to has a 200 yard range. If you're asking how far out can I hit the 10X then it depends upon what I'm using. I'm not a sniper, but I was proficient at shooting, scoring double expert in rifle and pistol during my service. That was initially with an M-14 then later the M-16 and both the .45 and .38. Although I haven't been able to test it, I expect to be able to place a killshot on a target out to 700 yards with both the Mosin and the DPMS. Because of what I have always done for a living, I tend to think along the lines of "fighting" capability when I get a gun. I have shot a lot of Vaqueros and Single Action Army type revolvers. I think my favorite is the Schofield, but in general, they just aren't for me. I like them, but I don't need to own one, if that makes sense. The bottom two, (both Taurus?) I would have in a heartbeat. I have had great luck with Taurus revolvers. My .44 is a Tracker and that new 3" .357 I am trying real hard not to buy (yet) is on the same platform. Agreed about "fighting" capability. I, too, look at functionality vs "classic". Obviously the Single Action pistols are classics. Good for target shooting and even hunting, but the Taurus 65 (or, better yet, the S&W 65) are better for self-defense. Taurus had a reputation for spotty quality but, aside from break-in issues, I haven't had any problem with them. A S&W shoots great right out of the box, some some models of Taurus, especially semi-autos, need a few boxes of rounds run through them first. Not shown, but I also have Rossi 971. Same design. It's sitting in a bag in one of my cars. A .357 is great car gun. I have read about them, but I have never handled one. I think it is an interesting concept, but more conventional revolvers work fine for me and I don't know that would want or need to try something pretty radical like that. I might change my mind if I shot one. I know someone who has one. I haven't seen it, but we have talked about it and he seems to like it. The Mosin is an interesting gun. I have had a few come through here and they actually perform pretty well. I just get a kick out of them because they are like 10 feet long and look more like a WWI anti-tank rifle than an infantry rifle. The photo of yours looks good. The 7.62 x 54mm cartridge itself is not bad. It is roughly comparable to a .30-06. It is the same round used in the Dragunov. Work with it a bit and I would bet you could exceed your 700 yard expectation... maybe by a couple of hundred yards. I have 2 precision rifles, 4 if I claim joint custody of my wife's. My favorite is my Ruger Precision Rifle in 6.5 Creedmoor. That is about a mile gun. The Honey Badger has an identical one. My other one is a heavy barreled Remington 700 in 7.62 x 51mm (.308). For planning purposes, that is about an 800 yard gun, but I have hit with it out to 1100. My wife's other precision rifle is a custom made .22-250 built on a 1903 Springfield action. Heavy barrel, Monte Carlo stock. The .22-250 round is hyper fast, but the light bullets are really affected by wind and other environmental factors. That tends to limit their effective range. In good conditions, it is a good 700 yard gun for target purposes, although with the right round, guys have made 1000 yard shots with them. I wouldn't try to engage personnel beyond about 300 or 350 with it. It just bleeds off energy too fast. Last edited by Cletus; 02-11-2019 at 01:35 PM.